Is It Tuel Time for The Bills? With three preseason games behind them and the home opener looming, the Bills have found themselves forced into a Rex Ryan-esque quarterback circus. The only difference is, they didn’t want to be here. Judging by the other rookie QBs around the league, the Bills picked the right guy in EJ Manuel but, after a knee injury effectively knocked him out of preseason, all eyes turned to the unpredictable and injury prone veteran, Kevin Kolb. Kolb’s track record proved to be continuing as he went down Saturday after getting kneed in the back of the head on a diving play. That pop to the noggin ended up being diagnosed as the third concussion of Kolb’s young career and, possibly, the one that will bring a close to his short time in the league. So here we are. The undrafted rookie, Jeff Tuel, has found himself as the last QB standing and the obvious starter for the final preseason game against Detroit. In an interview, Tuel said that you have to be ready for anything, but who could have seen this coming? Jeff Tuel has showed impressive poise in the preseason and has had significant reps in practice. First year offensive coordinator, Nathaniel Hackett, has made a point to have all of his depth players ready to go at a moments’ notice; a method that has proven very effective given the events of late. Doug Marrone is feeding the dark clouds circling his team this week by signing two new quarterbacks to the roster. The first is the former USC phenom and 2005 Heisman winner, Matt Leinart. Leinart was drafted 10th overall by the Cardinals in 2006 and his career went downhill from there. After bouncing around between Arizona, Houston and Oakland, Leinart found himself out of work. Enter the injury stricken Bills. Leinart’s touchdown to interception ratio is dismal (15-21) but, he’s one of the few experienced free agent quarterbacks available and there’s no telling how long he’ll really be needed in Buffalo. The next QB added to the depth chart came from a trade with the Bills’ next opponent, Detroit. The Lions got linebacker Chris White and the Bills got Thaddeus Lewis. Lewis was picked up undrafted by the Rams in 2010 but didn’t play until 2012 with the Browns. His mere 32 professional pass attempts shows is lack of experience but, Lewis is only here as an insurance policy and will, most likely, be the first to go when Manuel is back healthy. 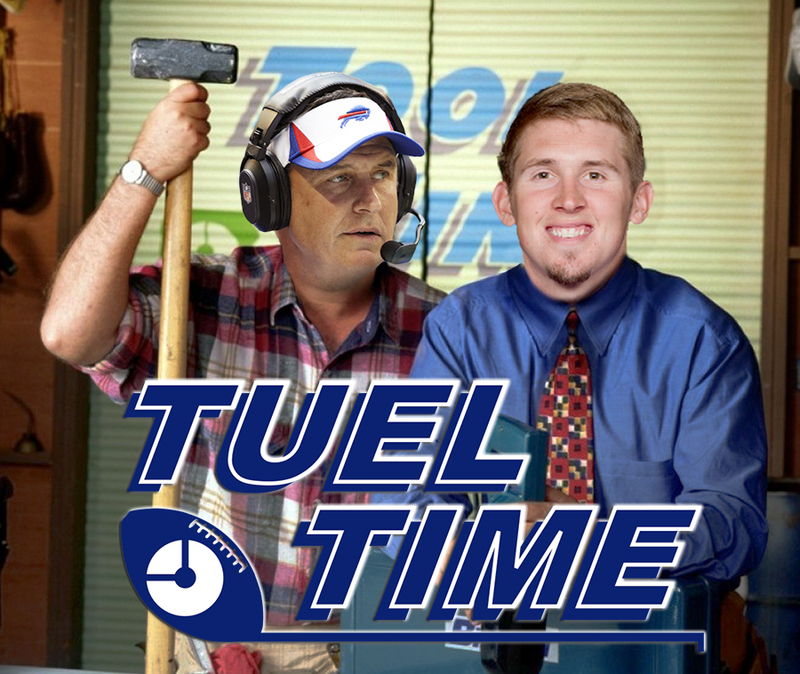 So, it looks like it’s Tuel Time *cue the opening theme song from Home Improvement*. The positives have been shown in his play. Tuel has a solid deep ball, something the Bills have lacked in a QB over the past few years. He’s definitely not afraid to throw the ball, too. He seems to have formed a good bond with the starters in his short time in Buffalo. He likes to stand up in the pocket which, for me, is always a plus and, at 6’3”, he’s big enough to do it. He does, however, come with his downsides. As much as the coaches want to say that he’s been tested, Tuel has only faced lower string defensive players. Granted, he’s done very well against them. Also, we won’t see his running potential this week since the team can’t afford another injury and the inevitability of starting Matt Leinart come week one against the Patriots. But, the chemistry he’s found with his teammates and his strong arm should, at least, keep the Bills competitive while they find a solution to the annual quarterback dilemma in Buffalo. Update as of 8/26/13 2:48pm EST: According to Doug Marrone, Jeff Tuel is the planned starter for week one against the Patriots.